I’ve been wondering how we would deal with something thoroughly “of the canon”, especially something from the 60s, for some time now given how much new music we’ve tended to consume at Devon Record Club, and as much as I love Another Green World, it’s not quite canon enough and there’s something about its sound that makes it seem a little “out of time”, so it didn’t quite give us that sense. So I thought I’d go for the daddy, possibly the most acclaimed album of all time. Revolver is a fascinating record; it seems incredible that it was The Beatles’ seventh studio album in four years, when you consider that Beastie Boys have only just released their seventh full vocal studio album after the best part of 30 years. It runs to just 35 minutes, yet there are 14 songs, none of them less than catchy or, at one’s most critical, formally interesting given the state of pop music at the time, and in those 35 minutes there are so many styles, so many ideas, so many melodies, that it can easily overwhelm and leave one befuddled as to what Revolver actually is in and of itself, what it stands for, what it did, what it still does. At 14 I think I only recognised Eleanor Rigby and Yellow Submarine, and so Revolver was a Pandora’s box to some extent; She Said She Said, Taxman, I’m Only Sleeping, And Your Bird Can Sing, and, of course, Tomorrow Never Knows, were bizarre revelations, pointing towards a different band again from the ones that produced She Loves You et al circa 1963 and then Strawberry Fields et al circa 1967 (the period from 65 through 67, from Day Tripper through Rubber Soul and Rain to Revolver is my favourite stretch of The Beatles’ career). The lurch from Yellow Submarine into She Said She Said is extraordinary, schizophrenic, psychotic, confusing. It makes no sense and yet it works. The Beatles can very easily seem obvious and passé, and I know that while Tom is a fan, Rob feels little or no need to listen to them because the songs are everywhere, ingrained in our society, but I still gain so much pleasure from going back every so often, from McCartney’s egotistic bassplaying on Taxman, from the melange of sounds on Tomorrow Never Knows, from the surging melodic thrill of And Your Bird Can Sing, from the exquisite melancholy of For No One, that I don’t think I’ll ever be tired of The Beatles, and Revolver in particular. To accompany Revolver, I chose this 10-minute piece of cinematic techno, the first song I ever heard by Orbital, the first piece of full-on techno I ever listened to, and probably the single piece of music that has changed the way I think about, react to, and listen to music the mist in my entire life. I’d listened to Screamadelica and Massive Attack and Björk a lot through 1995, moving slowly further and further away from boys with guitars, but Orbital was a final leap into the beyond; once over the wall there lied Prodigy, Underworld, Aphex Twin, and then, in the future, Four Tet, Caribou, Stars Of The Lid, and so much other music that I love so much and wouldn’t ever want to be without. I’m grateful to Orbital, and to this song in particularly for giving me the tools to enjoy it. 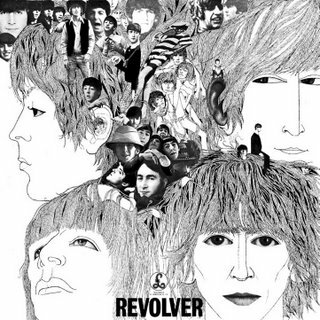 Tom Listened: I recall obtaining a version of Revolver in 1981 from a pirated cassette stall in Hong Kong, along with (their words not mine) Ob La Di Ob La Da (Vol 2) – ie the second disc of the White Album – and one of the early ones, A Hard Day’s Night I think. I had never heard of Revolver and although I fell in love with all three albums, Revolver hit hardest. I think it’s interesting that both Nick and I discovered The Beatles for ourselves when we were both quite young and during a period of time when the Beatles were relatively rarely mentioned. Classic albums are much less satisfying if you’ve already heard two thirds of the songs beforehand! Whilst Tomorrow Never Knows was playing (surely one of the most, if not THE most, significant single step forwards in the history of ‘pop’ music) I had a rant about young people and their conservative tastes and how, a few years ago, I played this and 9 other Beatles tracks to one of my classes and this was very poorly received. So I got my tutor group of mainly 18 year olds to review it. Of the 13 students who produced a review, 5 were pretty much wholly positive, one was wholly negative and the other 7 in general liked the song but found the music confusing and cluttered and complained that it was hard to hear the lyrics. It appears I underestimated them! Rob listened: It’s easy and largely pointless to say that The Beatles created pop music. Listening back to their records and tracing the genetic codes of the music we’re listening to 40 years later is fun, but largely an empty exercise. They invented nothing, they just got to empty territory before anyone else, colonised it almost completely, plucking the riffs from the trees, building houses across the genre flatlands and bathing in the rivers of production techniques and studio possibilities. Their offspring have been the dominant strain in pop and rock ever since. The Beatles were hard working, talented, charismatic, creative, curious, but not geniuses. Circumstances gave them the opportunity to expand way farther, way more quickly than any other band had before and they had the talent and drive to do so. Someone had to. In doing so they set the templates for both pop music and pop stardom. If we set them as a cultural measuring stick, then of course they will be regarded as the best, the most infllutential the most original. I’m just not interested in them. I don’t listen to them, i don’t care about them. They never got to me at an early age, like they did Tom and Nick, other than via the radio and that’s always been enough for me. I’ve never felt sufficiently interested to listen any deeper, which is not the reaction I had when I heard Dylan, the Velvets, Beefheart etc. You are welcome to argue than none of the music I love would exist without The Beatles, but agin, that’s irrelevant. Anyway, that’s got that off my chest. I enjoyed listening to ‘Revolver’ and i’m glad Nick chose it. I knew all but four of the songs (again, why bother listening back when you can absorb the back catalogue just by keeping your ears open), and the whole thing passed very pleasantly, with the possible exception of ‘Taxman’, a classic riff-and-strut pop song blighted by a lyric railing against progressive taxation sung from the heart by a suffering Harrison. Poor George must have been down to his last ten million and was understandably upset. It’s a shame he never got around to writing that extra verse in which the taxman takes his money and builds schools and hospitals for poor people.